Here’s a quiz for you. Look at the photo below (don’t read the caption yet). Which is more expensive? Is it 1.) 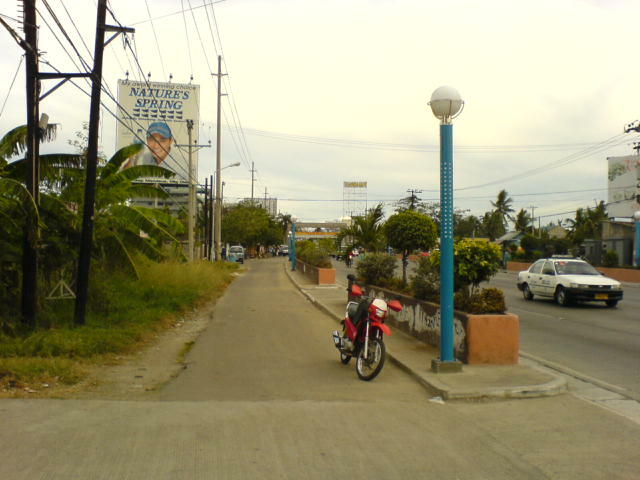 the street lamp on this road in Mandaue City in Cebu or 2.) the motorcycle and the bag that contains a laptop, digital camera, and various other gadgets of my trade? Here’s a hint: the lamp is part of the batch bought by the Department of Public Works and Highways (DPWH) for the Association of Southeast Asian Nations (Asean) summit in Cebu. That hint was a giveaway, wasn’t it? That single lamppost, if you believe government officials, costs P224,600. The motorcycle costs, at a discounted cash purchase, P51,000. The laptop, again at a discounted purchase, costs P43,000. STAGGERING PRICE. This lamppost on a street in Mandaue City, Cebu costs P224,600 per unit. More than double the cost of the parked motorcycle and the bag that contains a laptop, digital camera, voice recorder, and various other digital accessories. Click on photo to enlarge. Even if you include the digital camera, micro tape recorder, USB stick, and various laptop accessories in the bag, it still wouldn’t add up to half of the purchase price of that single lamppost. That single lamppost costs more than a second-hand car. And that lamppost is not even the most expensive model. Anti-graft investigators at the Ombudsman-Visayas found models, installed in Mandaue City, costing more than P300,000 each. Multiply this cost by the hundreds of units DPWH bought and the amount is staggering. It would have been enough to turn some of the posts into Wi-Fi access points and then roll out a municipal Wi-Fi system for Metro Cebu. That would have been a massive boost for Cebu tourism and commerce.